This is the recycled book I read for the month of August. 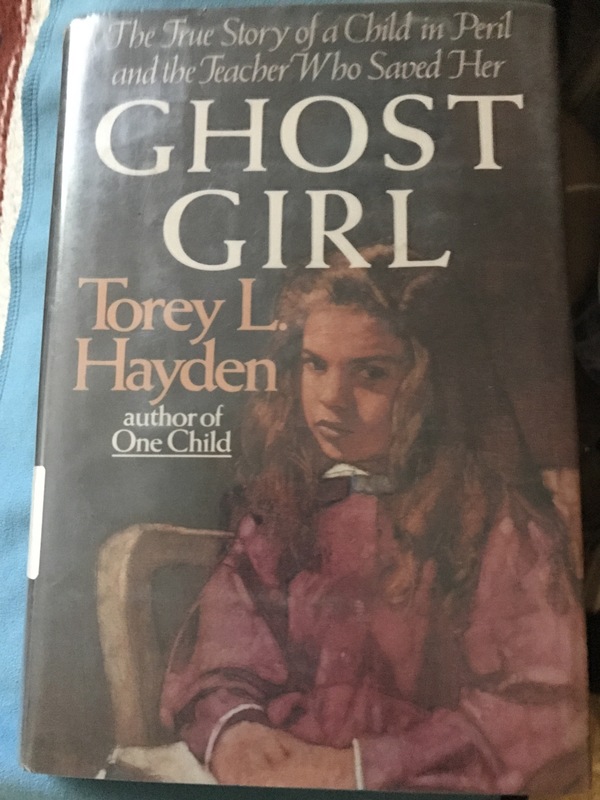 “Ghost Girl”, by Torey L. Hayden, is one I’ve read before. This exact one is from a library book sale, I’m pretty sure. It still has the library stamp inside. 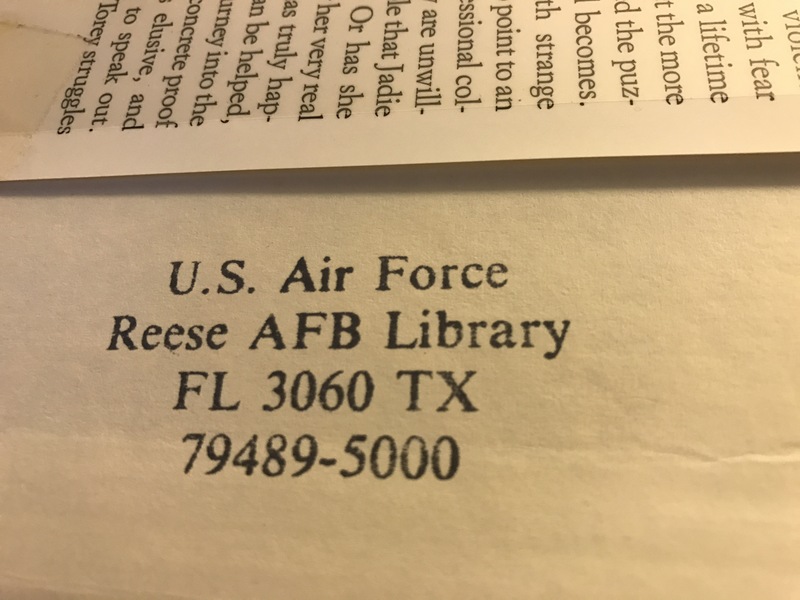 It was printed in 1991. They have since closed down the Air Force Base here. 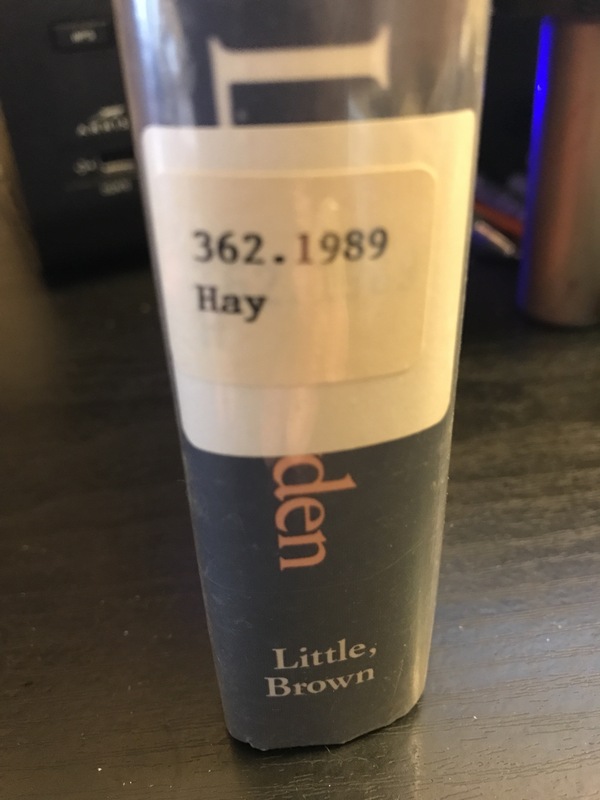 I’ve read a lot of Torey Hayen’s books, and there have been quite a few. She is one of my favorite authors. As a teacher of special education children, she relates her experiences in this area. Her specialty is in elective mutism, where a person is fully capable of speaking, but refuses to do so, due to psychological reasons. She writes of her struggles in teaching those with this problem, and also those with autism, handicaps, traumas, and developmental delays. All her books are very easy to read, with recalled conversations, and the day to day minutiae of a classroom of children with diverse learning abilities. In this book, she has a student named Jadie. She does not speak. Ms Hayden keeps working with her, to bring her out of her withdrawn state, and soon discovers, Jadie can speak. This is only to her, in the privacy of the classroom coat closet. There, she tells the most horrible tales of abuse that has happened to her. The thing is, she names those who abuses her as the television characters of the show, “Dallas”. Now, Ms Hayden tries to figure out if all that Jadie is saying is for real, with actual people in her life, or if she is just making all this up. She goes to her principal, and social services, but is hesitant to get authorities involved, if all this that Jadie is saying, is just make-believe. But, she does , and what is found out, is much worse than anyone could imagine. I know this subject matter is not for everyone, but it is good to know of these kind of circumstances, and that there are those, like Ms Hayden, that are there to help the children, in any way she can. I recommend all of Torey L. Hayden’s books. This one sounds really interesting. I wonder if these kinds of real-life situations are what drew Mrs. Hayden to her fascination with elective mutism? It is,interesting, as all her books are. I read from her bio, that she started as a volunteer in a program for disturbed and disadvantaged preschoolers. This was in her freshman year of college, She then went on to get her degrees for this type of work. Interesting… She should be admired for her work, that’s for sure!